In a skillet, cook the bacon over medium heat until golden brown. Stir occasionally to keep the bacon from sticking to the bottom of the pan. In a separate frying pan, sauté the onion and garlic until they begin to caramelize. 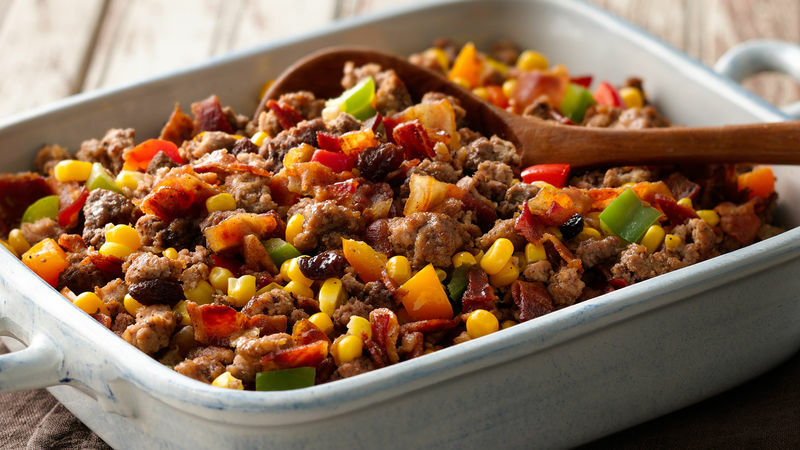 Add the ground pork and beef- mix well and make sure the meat cooks evenly. Season with salt and pepper, then stir-in the corn, raisins and bell peppers. Cover the frying pan with a lid and continue cooking for 10 minutes. Once ready, stuff the turkey before putting it in the oven. The ground pork can be switched for ground turkey in this recipe. This sabroso stuffing works well for filling bell peppers, green zucchini and, of course, the traditional Thanksgiving turkey. Even though I don't usually prepare a stuffed turkey, this recipe is one of my Thanksgiving dinner favorites. You can also make this dish ahead of time and keep it hot until ready to serve. I assure you that guests will line-up around the table for more than one serving, so be prepared to have a second dish ready just in case!